The BARCELONA - IBIZA and IBIZA - BARCELONA races are NOMAN exclusive premier ocean rowing events. Teams of amateur rowers are pitted against each other across 200 miles in journey that is expected to last 3 days. Rowing across an ocean or sea is like no other sport. Ocean rowing is as much about the crew's’ ability to cope mentally, as it is about technique and physical strength. In 2013 the Barcelona-Ibiza: Row to End HPV was NOMAN’s inaugural event and an outstanding success, raising over $1 million and attaining press on an national and international scale. In 2015, the capacity of the event was doubled as a second race from Ibiza to Barcelona was introduced. The capacity or the race was once again doubled in 2017 as 4 crews of rowers faced some of the toughest conditions in the five-year history of NOMAN, combating the blistering sun, fierce winds, fatigue and sea sickness. In 2017, the first all-female crew competed in the IBIZA - BARCELONA race finishing second. The Trois Etapes events presented a unique opportunity for cyclists of all ages and abilities to race on the climbs of the Grand Tours with professional cyclists. No other event in the world gave amateurs the thrill of pro-cycling for a cause like the Trois Etapes. Team NOMAN won the TE Tour 2015 on the 9th of August, taking on the giant climbs of the most famous professional race in the world! The victory was preceded by another 1st place on the TE Giro 2015, in which Team NOMAN took home the Maglia Rosa – a solid comeback after finishing 2nd in the same race in the summer of 2014. 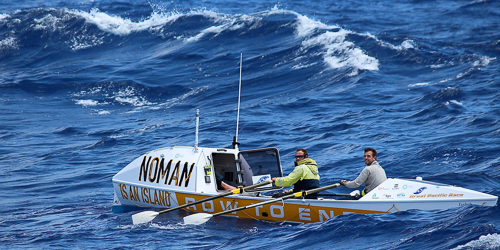 In the summer of 2014, team NOMAN competed against 14 other teams in the Great Pacific Race. This was the world’s first ocean rowing competition between Monterey Bay, California and Honolulu, Hawaii. Our team was the youngest to ever attempt the crossing, breaking the world record as the youngest crew to ever achieve this incredible feat. Check out the ITV segment, including words by Olympic Gold Medallist and NOMAN ambassador, Mark Hunter.